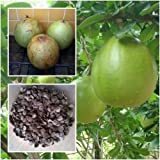 Calabash Tree growing tree of the genus Crescentia also known as Crescentia cujete, Calabash Tree perennial evergreen used as ornamental or medical plant, can grow in tropics climate and growing in hardiness zone 13+. Flower color can be in green, orange, pink or brown in bell shape to mouth. Fruit not edible in green color.